This game isn't a matchup up of traditional powerhouses, but it is a big statement game for both teams. Olathe Northwest's honeymoon is over. 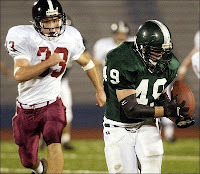 The school first fielded a varsity football team for the 2004 season, and it has since been five long years for the school with very limited success. Olathe Northwest needs to get things going in year number six, or the negative rumblings will only get louder. As for SM East, the first game of the season will be the opening act of new head coach Chip Sherman's tenure with the Lancers. Sherman is one of the most well known football coaches in the KC Metro, and victory number one could come in the first game if his team plays the way his teams of the past have. This was the game everyone wanted to see last season--but it never quite worked out that way. Olathe East and SM West both finished the regular season undefeated last year, but both also suffered first round playoff exits, and therefore the game never took place. Both teams lost a decent amount of firepower from last year, but the two schools are two of the better football programs in the area and this game will show it. In the first round of the 2008 playoffs, Olathe North upset the undefeated Hawks from Olathe East in a thriller--well, it was a thriller for Olathe North fans. This season, the tables should be turned. Olathe North fields what should be their most talented team since 2004, and Olathe East has more question marks surrounding their team than they have had in years. An Olathe East victory would be complete payback from last season. Last year this game turned out to be very exciting, with big plays, and lots of scoring. SM West took home the victory in the end, but Camren Torneden had not taken the reigns at quarterback for the Firebirds either. This year, Lawrence Free State travels to Overland Park in late September for what should be another great game, amongst two of the projected top teams in the league for 2009. Lawrence Free State's spread option attack against SM West's Power-I running game should make for a clash of styles not often seen in the Sunflower League. When I interviewed Camren Torneden several weeks ago, he was quick to bring up Olathe North. "Olathe North," Torneden said, "They're going to be tough." But so is Free State. This game could feature as much athletic talent on one field as any other game throughout the season--anything but a classic game will be a dissapointment. Lawrence Free State's new stadium is also nearing completion, and from the looks of it, it was set up for games such as these. The stadium is small, prestine, and has a very intimate feel. The stadium could be great nitch for big time victories for Free State. Last year, this game was probably the most exciting matchup in Johnson County throughout the entire season. Blue Valley quarterback Anthony Abenoja seemingly had his way with the Olathe North defense, throwing 317 yards and four touchdowns, while Olathe North's James Franklin combated that, rushing for 267 yards and four touchdowns. Olathe North ended up losing 42-41 after their kicker botched an extra point. Both of these teams should be among the tops of the respective leagues come late October, and this district matchup will hopefully be as thrilling as last year. I think you could make a pretty decent case that the annual Free State vs. LHS game is the biggest rivalry in the Sunflower League. While rivalries such as Olathe North vs. Olathe East have entertained us so much over the past years, the Lawrence rivalry truly pits one side of a city against another. This game is always exciting, and you might as well throw out each team's record come game time--it doesn't mean anything when the two face eachother. The "Hula Bowl" as it is known the the Shawnee Mission North and Northwest faithful always creates alot of hype--even if it has a tendency to be a lopsided game. The past few years SM Northwest has cleary been the better team in this rivalry, but after losing many key players for graduation, the Cougars don't appear to be such a resounding favorite. But, by the time the last week of the season arrives with this game, the favorite may be as clear as day. My fondest memory of this game was a Facebook war that errupted before the 2007 football season. A group was created on Facebook, inviting all people who planned on attending the game to join. Well, of course, the smack talk got started on the group's wall and once players from both teams started posting it got pretty interesting. Needless to say, this game is a heated rivalry even though the results don't always support that.